Eek! I’m at the beach and not paying attention to days and times right now. Sorry for showing up fashionably late to my own party. Congrats to Rebekah who won the Silhouette Cameo giveaway from last week! 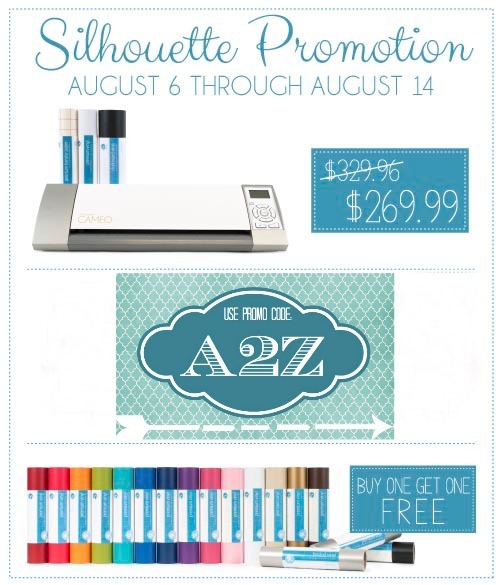 If you didn’t win and are wanting to purchase a Silhouette, there is currently a great promotion going on right now. You can also buy one get one free on all vinyl when you use the promo code: A2Z. Let’s see what you have been up to this week! Please add a text link back to this post if you link up to my party. Thank you! Thanks for hosting, Beth! Have a great time at that beach! Thank you for a great party Beth! Enjoy spending time with your family at the beach! Thanks for hosting! Have so much fun at the beach! Thanks for hosting in absentia! Thanks so much for the party, Beth! Have a great week! You host such a great party, thank you! I enjoy your website and projects also. I didn’t know you were in VB Christy! How fun!! Enjoy your time at the beach! Thanks for hosting!